August 2011 Archives - Newman Dignan & Sheerar, Inc. - Providence Fee-Based Financial Advisors August 2011 Archives - Newman Dignan & Sheerar, Inc.
Hurricane Irene, which thankfully had weakened to tropical storm intensity [less than 74 mph] by the time it reached New England’s shores, caused much less damage than anticipated. The same can be said about the summer’s “Bear Market”, which rallied by 4.7% last week. Although second quarter GDP was revised downward to +1.0% [+1.1% expected vs. 1.3% preliminary], Bernanke’s Jackson Hole speech implied that the value of the dollar is somewhat important [!!] when the Fed is deciding monetary policy. Moreover, he threw the “stimulate growth” hot potato to the congress and the administration. The rally pushed further ahead on Monday [this is a hurricane-delayed update] based on some progress in resolving the Greek financial crisis coupled with better July consumer spending. Upcoming data points this week include Fed minutes, unemployment claims and nonfarm payrolls. Last week was another challenging week for investors as most global stock markets continued to sell off. Year-to-date the Dow Jones, S&P 500, the Nasdaq, and the Russell 2000 are down 6.6%, 10.7%, 11.7% & 16.8% respectively. Investors have been flocking to U.S. treasuries which continue to exhibit their safe-haven status regardless of Standard & Poor’s recent downgrade. A good barometer for the bond market is the Barclays US Aggregate Bond Index which is up 6.42% year-to-date…diversification is not dead! This week is relatively quite regarding economic and corporate related news. Therefore our focus will be on Friday’s GDP report and the Jackson Hole speech by Ben Bernanke. Consensus believes we’ll see 2nd quarter GDP revised to 1.1% following the preliminary estimate of 1.3%. “The more things change, the more they stay the same.” What we are thinking of is human behavior and how we swing between fear and greed, or as another commentator put it – panic and euphoria. Veteran market watchers have seen the swings over and over. We can understand these swings and aid our portfolios in the process. Several indicators can help us in the analysis-activity of corporate insiders buying and selling, behavior of the average investor as measured by the AAII index, and changes in the ratio of put to call options on stocks. One of the better indicators is insider transactions- a pickup in their buying their own stock is bullish. As far as the average retail investor, a significant pickup in selling both stocks and mutual funds can be an indicator of fear or panic setting in. 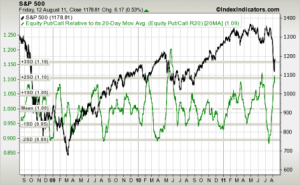 The so called put/call ratio is more bullish when extreme levels of put activity or bets a stock or a market going down will occur…the chart below illustrates the S&P 500 (black line) vs. the equity put/call ratio (green line). Whatever the sentiment, most important is knowing the value of your investment and your willingness to buck the trend when inefficiencies in pricing occur. The classic value investor Warren Buffet recently commented that the underlying value of the market is good. He has a rather good track record! Weekly Commentary: S&P Downgrades U.S.
Last week the DJIA declined 5.75% reflecting concerns about the strength of the U.S. economic recovery and the continuing worries over European debt and global economic strength. On Friday, the July jobs report was better than expected with a total of 117,000 jobs created. Nonetheless the current rate of job creation is not sufficient to bring down the unemployment rate which remains above 9%. Despite the downgrade U.S. treasury prices strengthened as they continue to be regarded as a safe haven in uncertain times. Hopefully, this downgrade will put pressure on Washington to get our financial house in order. The stock market has entered a correction with a decline of more than 10% from its previous highs in April of this year. For long-term investors this presents an opportunity to rebalance portfolios and add to quality stocks. The DJIA currently sells at 11.5 X next year’s earnings and yields 2.65% versus the 10-year U.S. treasury yield of 2.5%. The DJIA declined 4.24% last week to close at 12,143 as the markets reacted to the ongoing drama in Washington and weakening economic news. “Clowns to the left of me, jokers to the right … here I am stuck in the middle with you” …sound familiar? Well, Washington finally came to an agreement over the weekend – at the last moment, just as we believed. The good news is that the United States will continue to pay its bills – at least for the moment. 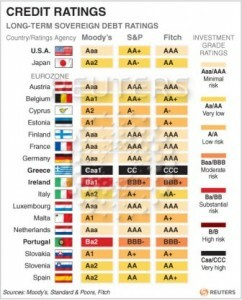 We suspect, however, that the U.S. debt will likely be put on negative watch by the ratings agencies (not necessarily downgraded). It remains to be seen whether or not our distinguished senators and congressman will actually put some teeth into upcoming discussions about spending cuts. Attention will now shift to our weakening economy (where it should have been in the first place). First quarter GDP was revised downward to just 0.4% versus the original estimate of 1.9%. In addition, second quarter GDP came in at an anemic 1.3% … all-in-all, one of the most disappointing economic recoveries since World War II. Earning reports continue to be decent, yet we’re keeping an eye on earnings reports as more and more companies are beginning to bring down their future growth expectations. Despite all the bumps in the road we continue to see a muddle-through economy for at least the next few quarters. We suspect that markets are discounting the challenges that exist today.